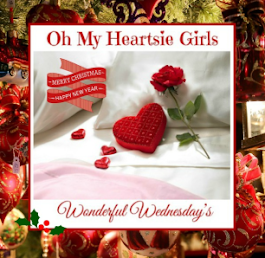 Welcome, readers! 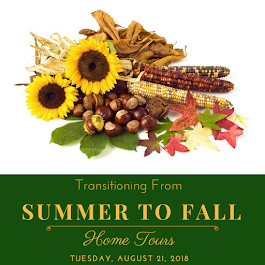 Welcome Autumn! 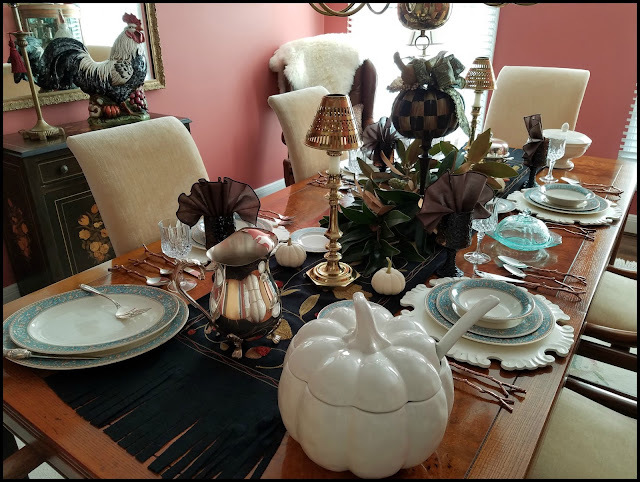 I'm glad you're here today for my seasonal tablescape, which is set in my dining room (versus my more typical tablescaping in the sunroom). 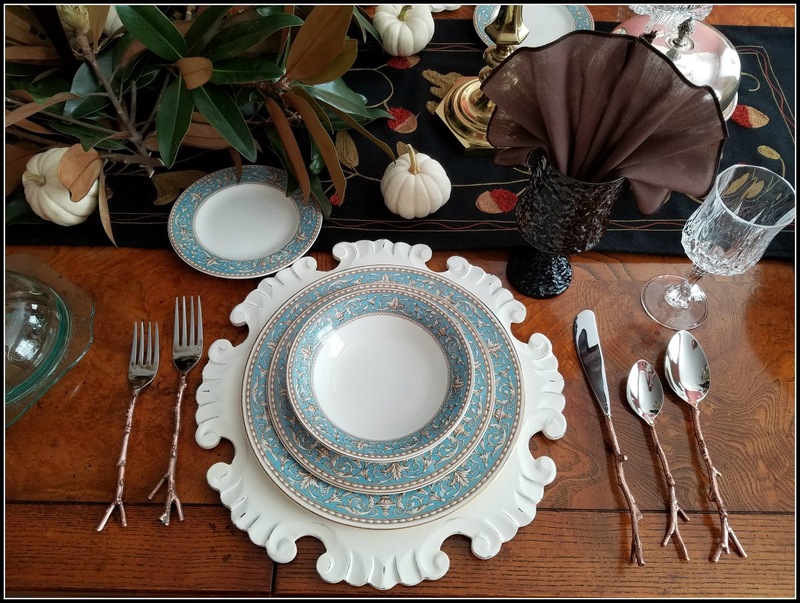 If this is your first visit to my blog, you should know I love using vintage pieces I collect to do my tablescapes, and my dish collection runneth over! Though won at auction several years ago, it is only this autumn that I have been inspired to set a table with this china. 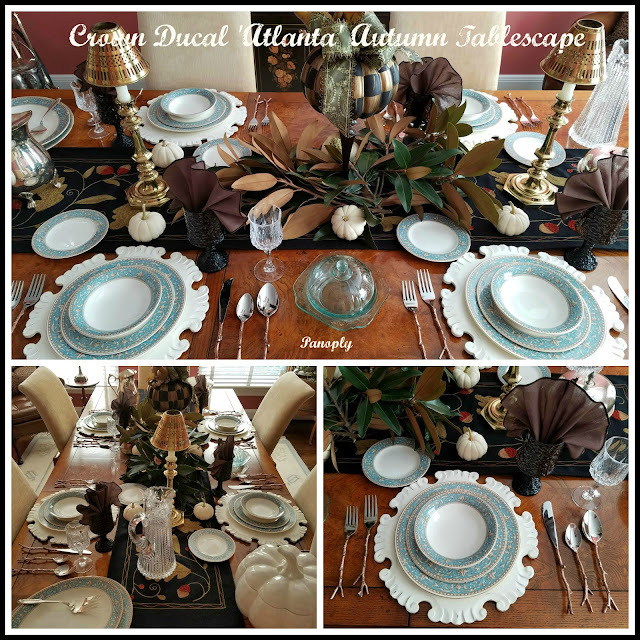 The turquoise, brown, gold and cream mix on the china being used - England's Crown Ducal in the Atlanta pattern - has always appealed to me in a classy, traditional way. 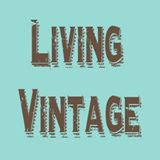 As a collector and seller of antique and vintage goods, I often fall prey to fostering my finds, maybe a little too long. I love vintage china, flatware, and linens, but I also love tabletop serving pieces and accessory items. 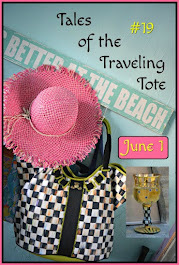 Not only that, I still enjoy adding a few current items in my mix. 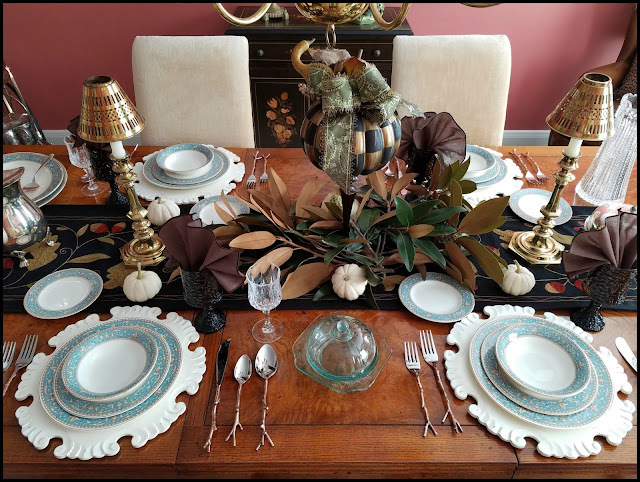 For this tablescape, the flatware is a new addition for me. The handles mimic the look of twigs, in a bronze finish. 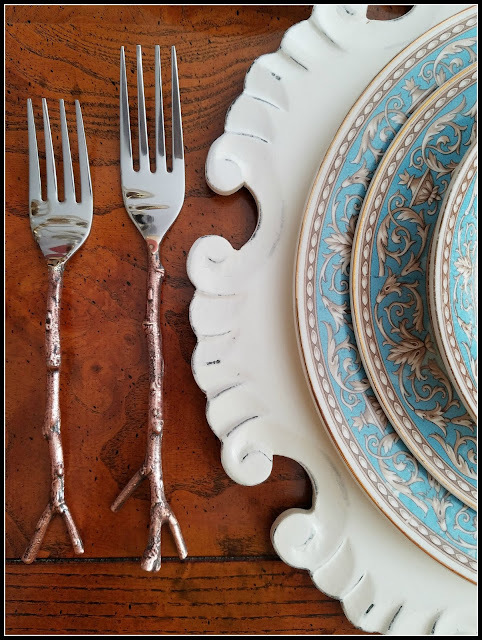 My blogging friend, Susan at Between Naps on the Porch, is responsible for inspired me to buy the flatware, as she has similar sets that I admire. 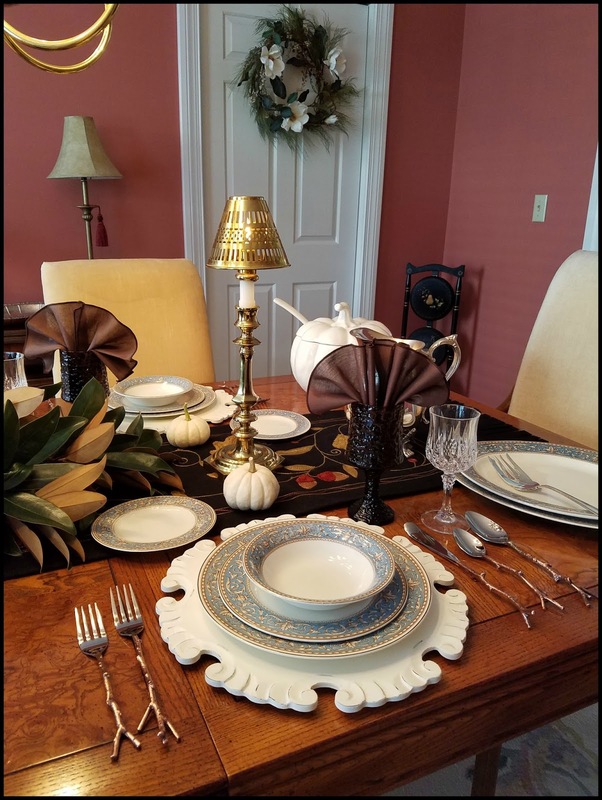 The flatware alongside this china, together with the distressed wood chargers, seemed fitting for a nice autumnal display on the wood table. My traditional wood table shall forever remain in its natural finish, never painted, as long as it remains in my possession. My table underpinnings consist of a wool felt runner I already had, which is embroidered with oak leaves and acorns. 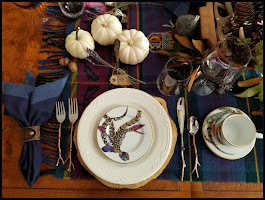 Vintage brown napkins are folded like a turkey's splayed feathers in the water goblets. 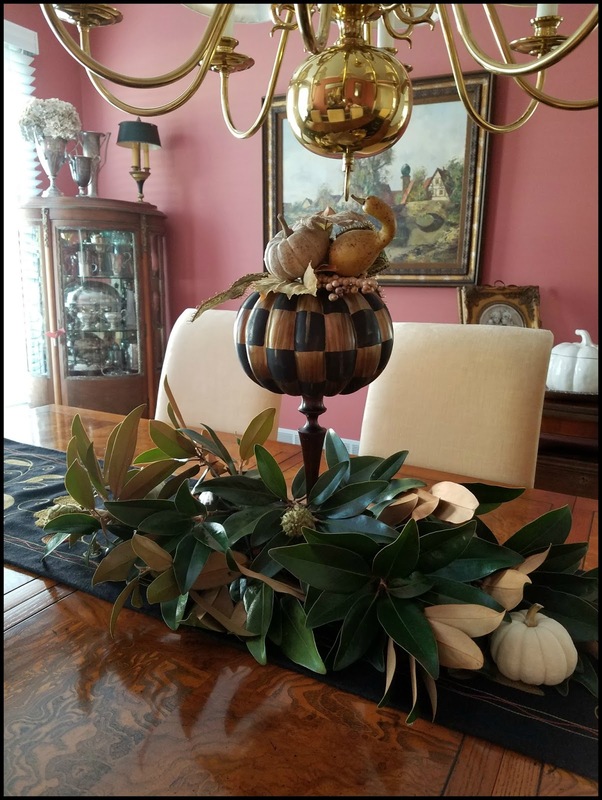 The centerpiece is a pumpkin assemblage, designed and created by my blogger friend Patti at Pandora's Box. 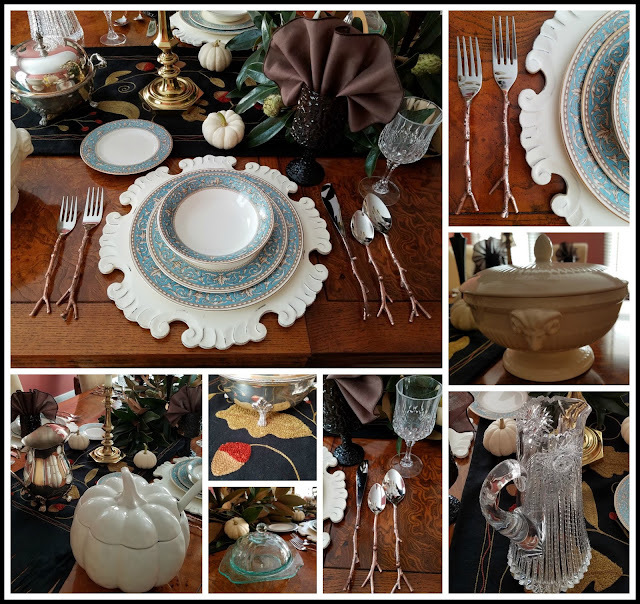 I simply cut magnolia stems from the garden and arranged them at the base, adding baby boo pumpkins around it, as well as at each place setting. Writing each guest's name on the baby boo with a gold or bronze liquid pen makes for an easy place card. Other notable serving pieces added to the table include a Wedgwood covered tureen with ram heads as handles. I have a fairly good size of antique and vintage ironstone/creamware/pottery collected, and this is one of my favorites for its unique design. My favorite pitcher in cut crystal is also used at this table, another of my vintage (estate) finds. 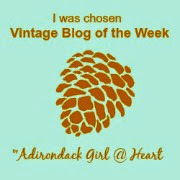 It works alongside my brown crystal water goblets (Lenox), and clear crystal wine glasses (Longchamp), both sets vintage. 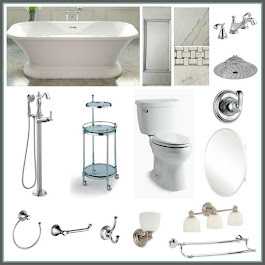 Mixing old with new elements is easy to do, and mixing metals is something else I find easy to do. 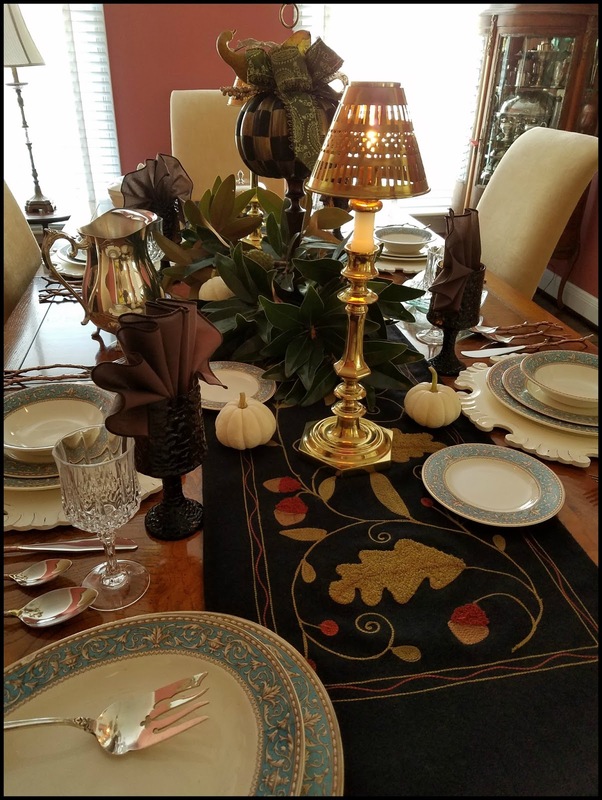 Along with the bronze finish flatware, two silverplate items - a water pitcher and smaller, covered tureen - are used on the table, as well as the candlesticks, which are brass (as is the chandelier). A couple of sterling serving utensils are set with platters in the china pattern. 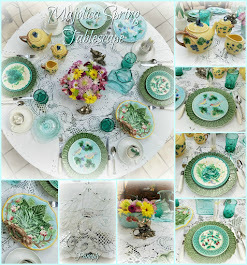 The turquoise covered butter dish is depression glass, and works with the color in the china's band. 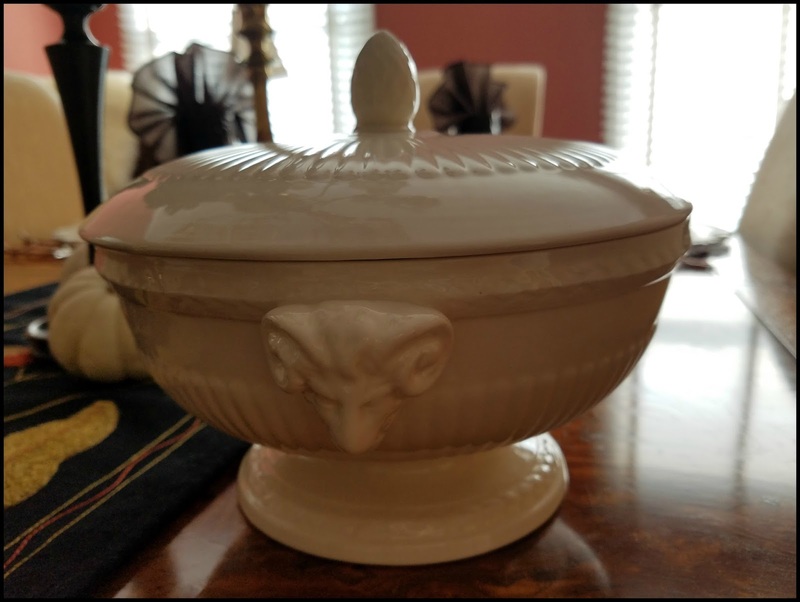 The cream pumpkin tureen is another newer item, a retail find last year. Because our dining room gets used infrequently for dining, I made ours serve dual purpose by placing a leather wingback chair in the corner, near the window. 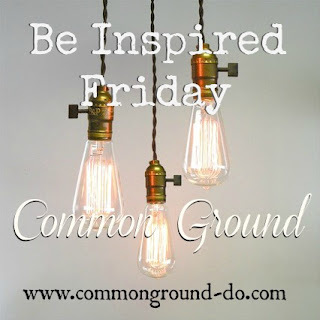 A small table, big enough for a candlestick lamp and coaster, makes it a great place to read. 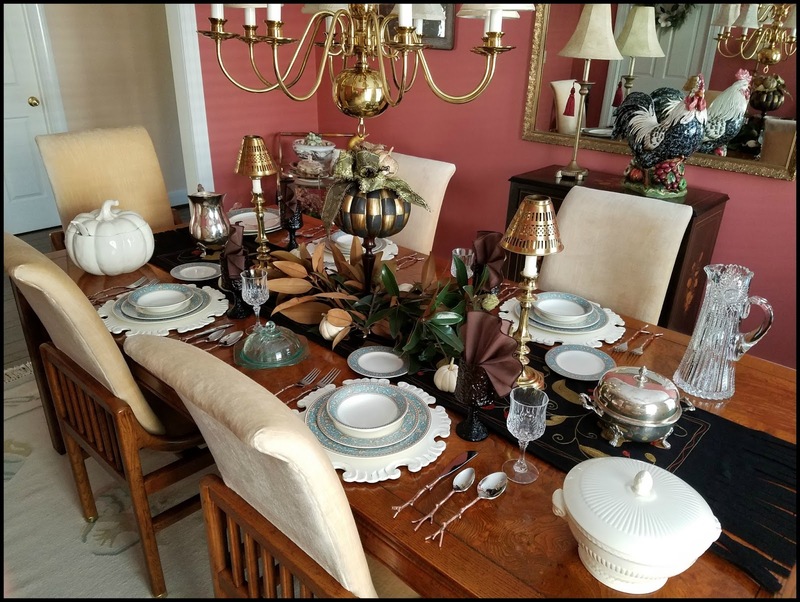 My dining room also provides some storage for dishes, all with vintage furniture additions over years of attending auctions. Among those items are the wood inlaid cabinet beneath the mirror (where the ceramic rooster sits), a French vitrine in the corner across from the wingback chair (stores most of my sterling serving collection and other metal pieces), and in the other corner of the mirrored wall is a bar cart. 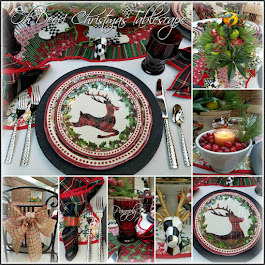 I use the cart for displaying some of my serving pieces and seasonal decor. The dining room is adjacent to the kitchen, separated by a service door that swings. We keep it open most of the time for easy traffic flow in our floor plan, but the photo below shows it closed. The small wooden piece in the corner of the room is a vintage, 3-tiered muffin stand. This room's warm rose wall color provides a nice ambience for evening dinners, especially when candlelight is used with a dimmer switch on the chandelier. 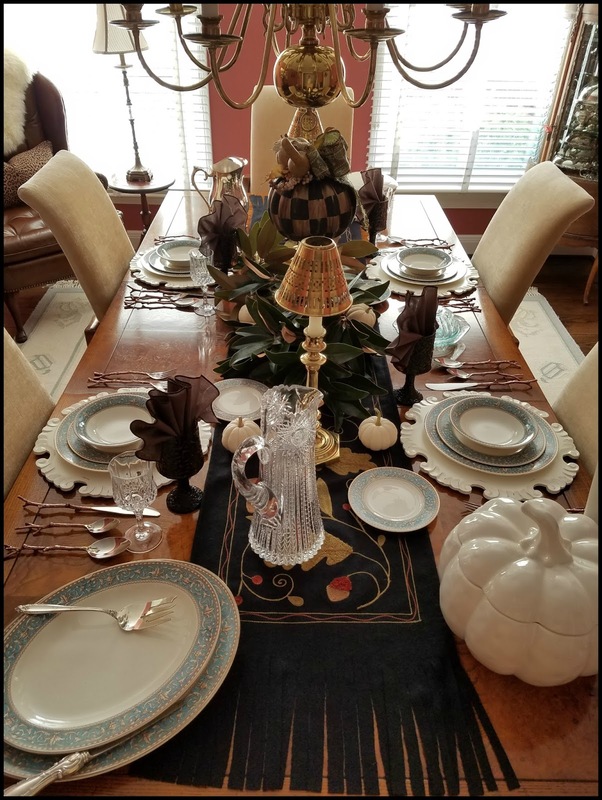 After the tablescape was struck, the runner and centerpiece remained on the table, and the pumpkin tureen rests on the demi table (a folded game table) along the wall in the photo below, not previously shown in this post. You can also see a better view of the French vitrine in the photo below. 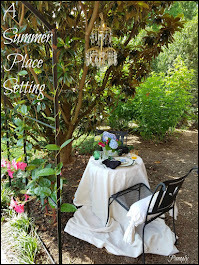 Although our most typical style of dining is very casual, either at the breakfast table or in the sunroom of our open floor layout (or out in a restaurant! ), every now and then the dining room is used with company. When I do use the dining room, I like to dress it fittingly. 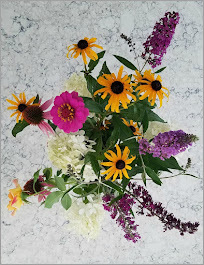 Thanks for your visit at the table today. 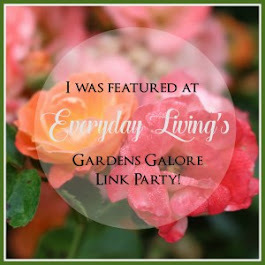 I invite you to browse my menu bar of topics at the top of my blog and, if you find you have similar interests, I'd love for you to come back. 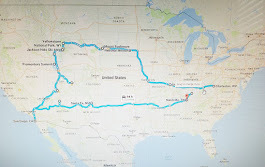 I hope you feel welcome, and leave a bit inspired. 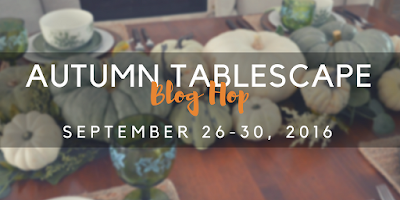 This week I am joining all the bloggers conveniently listed below for you to simply click on to see a plethora of autumn tablescape ideas. 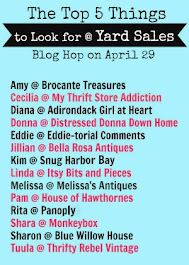 A huge thanks to Chloe from the blog Celebrate and Decorate for organizing and hosting this roundup! 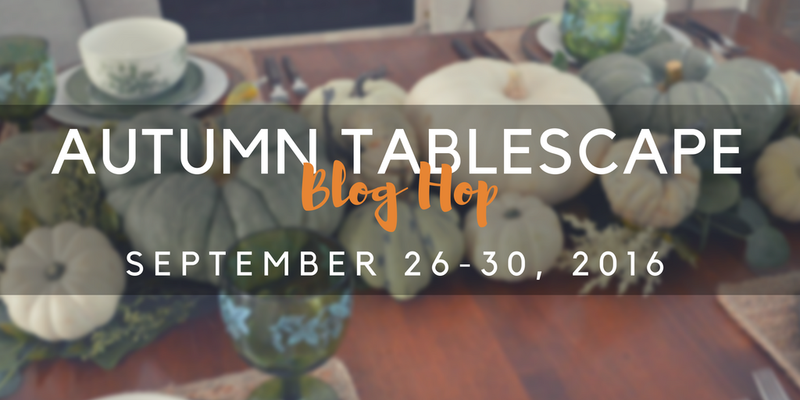 I am dedicating this blog post and tablescape to the honor of fellow blogger, Pat Freymuth, of Back Porch Musings. 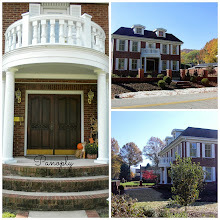 The blogging community has lost a great voice in the world of classy, traditional, lifestyle blogs, as evidenced by Pat's home, her tablescapes, and her personal style. Pat fell ill just a few short months ago, and I just learned a couple days ago of her untimely passing. Pat is, undoubtedly, now making her way through halls and rooms of sheer beauty and ultimate style in a heavenly space, her forever home. Farewell, Pat, you will be missed, yet remembered as one always true to herself!